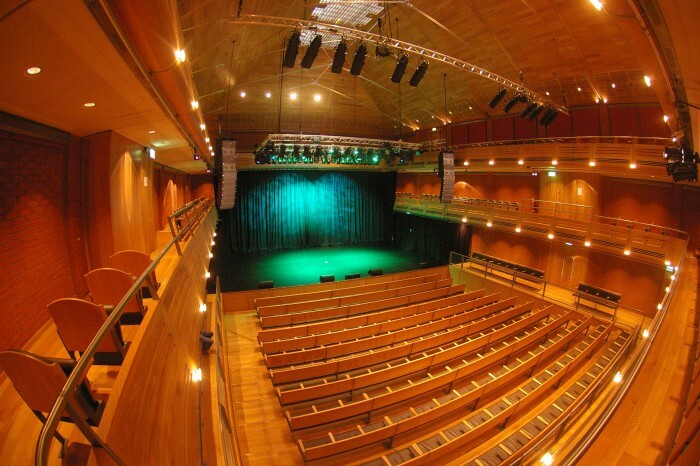 The new £18.5m apex multi-purpose venue in Bury St Edmunds, owned and operated by St Edmundsbury Borough Council, now has a Martin Audio W8LM Mini Line Array system as part of its permanent technical infrastructure. 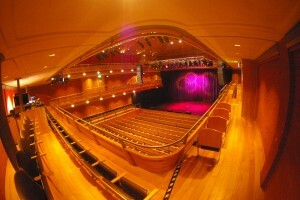 After the original fit out had been competed last year by Northern Light, new incumbent technical manager Tim Carr noticed that with an increasing number of amplified rock and folk events starting to appear on the upcoming programme of events, a conventional Left/Right proscenium line array hang was required to bolster the existing speech system. Although the work went out to tender, and several sound systems were put forward as potential solutions, Tim Carr already had prior experience of Martin Audio’s Mini Line Array — brought in by locally based W1 Productions when they were sponsoring a local band night. Thus the apex technical man was soon talking to W1’s Stuart Turvill about a permanent install. Since the venue was designed around two balcony levels, while the ground level can be easily reconfigured into a number of different performance arrangements, versatility and even coverage were paramount. For the ground floor seating is fixed to floating air-bearing wagons, and can be transferred to the basement via the pit lift for storage when not required; thus the venue can hold up to 650 (standing), 515 in raked (or flat floor) theatre style seating — or operate in the round. The solution evolved by Turvill and Carr was to install four W8L and two W8LM Downfill boxes per side, with each hang supported by a pair of Martin Audio WMX hybrid bass bins. Two pairs of wide dispersion Martin Audio ultra-compact Differential Dispersion DD6’s, mounted high up on the lighting truss, act as overhang/underhang balcony fills. The remaining pair of DD6’s are floor-mounted and angled on the lip of the stage for front fills, alongside six Martin Audio LE1200 floor monitors which the performers use for reference sound. The system is optimised using the dedicated DX2 loudspeaker management system — and Stuart Turvill is delighted with the result. “It was a no brainer to recommend the W8LM in view of the price and performance,” he said. “We rarely get the opportunity to fly the WMX subs — but in this case the design fitted nicely with the venue and it improved the coverage. Architects on the project were Hopkins Architects, while Haymills were the building contractors and Carr & Angier were the original acoustic consultants.